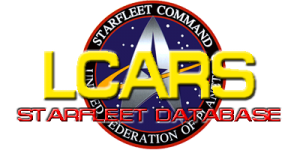 Welcome to the Starfleet LCARS Database. We at Starfleet believe that one of the best ways to keep consistency and high standards in role playing is to have a good source of reference and background information. The Phaser is the mainstay weapon of the Federation's Starfleet both as portable handheld weaponry as well as ship and station based weapons. It has been an important part of the Starfleet arsenal for two hundred years and continues today as a vital component of the weapons available to the organization. Read more. Register – Register an account to keep track of your contributions. Policies & Guidelines – Please go over our site policies and guidelines, before you start making contributions. Check out our Netiquette for wiki/internet usage. Style and formatting - Styles and Formats that we'd prefer. How to help – How you can help on the Wiki! UCIP on Discord – Join us on Discord! Users have contributed 956 articles to the Wiki! Note: This wiki is by the community for the community. This page was last edited on 7 November 2017, at 03:40.